Multiple pockets: 2 front pocket, 2 waist pocket,2 mesh pocket, main compartment with separate room for your items organized, such as pad, pc, book etc. 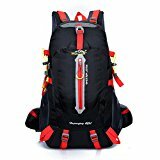 Coopache outdoor hiking Backpack, Travel Backpack,Backpacking packs. The backpack daypack is made from highly rip and water resistant nylon fabric, provide strengthen and long-lasting performance with minimal weight. Stress points are reinforced with bar tacking for increased longevity. Stuff the bag into its own pocket for storage—no extra fees, and unzip it when you reach your destination. Avoid overweight charges, simply unfold from your luggage and use it as a carry on for your excess baggage. ·Durable polyester Diamond RipStop material and 2-way quality SBS zippers with easy pulls for a trouble-free closure. ·Spacious main compartment to carry your personal stuff, with inner secure zip pocket for small items. ·Large front pocket with see-through mesh and pressure strap with click lock, and 2 side water bottle pockets. ·Waterproof so it protects your things from accidental drips and splashes. ·A sturdy loop and carrying handle for 1 hand lifting (folded or not), 2 breathable adjustable shoulder straps. 1.One year guarantee from Coopache. 2.Your Satisfaction is our Highest Priority.Please feel free to contact us with any questions regarding our products and shipping.